NEW YORK, New York – Further extending its world-class live production capabilities, All Mobile Video (AMV) recently purchased a Studer Vista 8 console for its new Epic 3D mobile production truck. The Vista 8 is fully 7.1 surround sound capable, with 72 faders and up to 250 inputs. The Epic truck was first used on July 21 for a 3D and 2D taping of Sheryl Crow in concert at the Roseland Ballroom in New York City. All Mobile Video is the country's premier provider of end-to-end video and audio solutions for entertainment, sports, and news programming and events. The company offers the full spectrum of services--from spacious Manhattan-based sound stages with full post-production capabilities to mobile production and editing trucks and extensive uplink solutions that travel worldwide--as well as an extensive equipment inventory that allows them to fully custom spec any facility or location. The Epic truck features a large audio room which, in addition to the Vista 8 console’s in-truck I/O complement, includes Studer stageboxes with up to 96 additional inputs. The Vista 8 digital console incorporates the worldwide-acclaimed Vistonics™ user interface, providing unmatched analog console-like control and a host of other groundbreaking features. The Vista 8 possesses powerful broadcast features to offer a highly sophisticated and flexible multipurpose live broadcast desk. 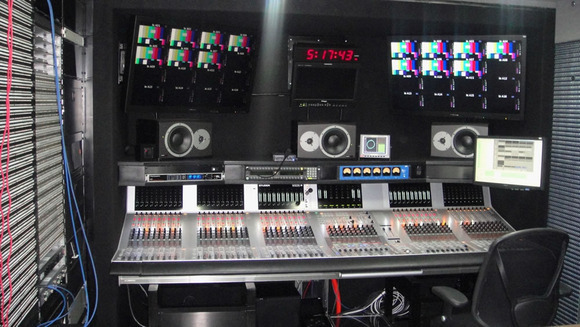 For example, its unique Control Bay design offers rapid access to all faders in a small footprint, making it ideal for both fixed install broadcast and OB van applications.